Fire has fascinated humans since the days of the cave man. Much revered for its heat and light (not to mention its ability to roast meat and marshmallows), this element also possesses the amazing power of transmutation. And transmutation, quite simply, is the ability to alter reality. Instantly. It’s creation energy. And thanks to a vision given to Joseph Rael, Beautiful Painted Arrow, we all have the opportunity to tap into that in a very sacred way—at the Fire Ceremony, held on the 7th of every month at 7:00 pm. What you’ll see if you come is quite simple. As the Fire Elder at the Center, I smudge, create a sacred circle, and lay the fire. At 7:00 pm, I invite the spirit of Fire to come. If Fire chooses to join us, all those gathered watch the fire in silence as it burns untouched until the last lick of flame disappears. Then I invite people to share what they saw or felt while the fire was burning. But so much more is going on than that. For starters, many of us use the fire for focused meditation. We watch for what direction the fire first falls, the way the flames twist and dance, paying attention to its pops and sparks and the patterns it leaves in the wood as it is consumed (or in what parts are left unburned). 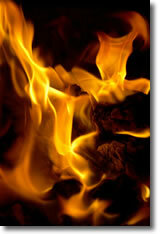 Fire uses these images to gift us with metaphors and insights. Each of us has a different perspective from where we sit (around the fire and in our lives), so what comes up is often different for everyone who participates. And all of it is valid. In fact, in the sharing, we can often see our metaphors reflected in and building upon what others have received, echoing the truth that we are all indeed One. Here’s another piece. When Joseph received the vision of the Fire Ceremony in 1984, Oceanus (creator spirit of the oceans) told him the purpose was to heal and purify the ocean. Joseph explains that in addition to the actual physical ocean, this is a metaphor for the ocean of cosmic thought. (Oceanus is, after all, a metaphor for the birth of new ideas). Oceanus said that by healing our own confusion, we actually help heal the confusion of the physical world. Joseph teaches us that everything is constantly in a state of vibration. Everything is (and all of us are) constantly vibrating, moving, evolving. Nothing is static. In every split of a split of a split of a second, our energy goes from the center of our being way out beyond the beyond, and then snaps back. And that keeps happening over and over again. And what comes back isn’t ever quite the same as what went out. It’s something new. In a very real sense, it’s reborn. And that’s exactly what Fire does with whatever we give it. Fire takes this unwanted, discarded thing and in the split of a split of a split of a second, it celebrates it, honors it, dances it out beyond the reaches of creation, and as it brings it back to us it rebirths it as something new that we can choose to value. Our lead becomes gold. (If you’re a Sun Moon dancer, think about the metaphor of dancing to and from the pole.) If we allow it to, this rebirth changes our lives and it can change the planet. So I invite you to come to the Fire Ceremony on the 7th of every month. And if you can’t make it, then light a candle and have your own fire ceremony with the intention of connecting not only with the Center’s ceremony but also with other Fire Ceremonies held in various places around the world, at 7:00 pm local time. Allow the spirit of Fire to seep into your pores, into your heart, and into your soul and burn away whatever you are willing to give up that no longer serves you. Emerge anew, reborn with fresh insights, and all of creation becomes reborn with you. This ceremony came from a vision of Joseph Rael, "Beautiful Painted Arrow" in 1984. Its purpose is to heal and purify both the planet’s physical oceans and the oceans of cosmic thought. Through healing our own confusion, Joseph was told by Oceanus (creator spirit of the ocean and the metaphor for the birth of new ideas), we can heal the confusion of the physical world. Each Peace Sound Chamber around the world holds a fire ceremony at 7 pm local time to honor and continue Joseph’s vision. The fire elder lights a sacred fire, and those gathered watch it in silence until the last flame disappears. Come to the fire ceremony if you enjoy focused meditation, if you are looking for new ideas and insights, if you seek to release and transmute something that does not serve you, if you want to join in the service of healing the oceans (both physical and cosmic) or if you’re simply called to participate in a ceremony that honors this powerful elemental force. We suggest you arrive at the Center around 6:45 pm. For more information, call Katy Koontz at 865- 693-9845.